The article that introduced the concept of "alkaloid". The name "alkaloids" (German: Alkaloide) was introduced in 1819 by the German chemist Carl Friedrich Wilhelm Meißner, and is derived from late Latin root alkali (which, in turn, comes from the Arabic al-qalwī – "ashes of plants") and the suffix -οειδής – "like". [nb 1] However, the term came into wide use only after the publication of a review article by Oscar Jacobsen in the chemical dictionary of Albert Ladenburg in the 1880s. There is no unique method of naming alkaloids. Many individual names are formed by adding the suffix "ine" to the species or genus name. 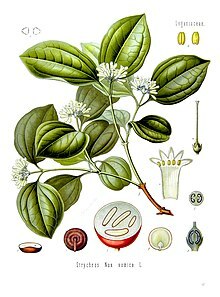 For example, atropine is isolated from the plant Atropa belladonna; strychnine is obtained from the seed of the Strychnine tree (Strychnos nux-vomica L.). Where several alkaloids are extracted from one plant their names are often distinguished by variations in the suffix: "idine", "anine", "aline", "inine" etc. There are also at least 86 alkaloids whose names contain the root "vin" because they are extracted from vinca plants such as Vinca rosea (Catharanthus roseus); these are called vinca alkaloids. Studies of alkaloids began in the 19th century. 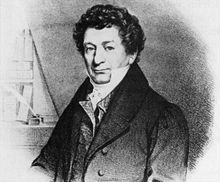 In 1804, the German chemist Friedrich Sertürner isolated from opium a "soporific principle" (Latin: principium somniferum), which he called "morphium" in honor of Morpheus, the Greek god of dreams; in German and some other Central-European languages, this is still the name of the drug. The term "morphine", used in English and French, was given by the French physicist Joseph Louis Gay-Lussac. "True alkaloids" contain nitrogen in the heterocycle and originate from amino acids. Their characteristic examples are atropine, nicotine, and morphine. This group also includes some alkaloids that besides the nitrogen heterocycle contain terpene (e.g., evonine) or peptide fragments (e.g. ergotamine). The piperidine alkaloids coniine and coniceine may be regarded as true alkaloids (rather than pseudoalkaloids: see below) although they do not originate from amino acids. "Protoalkaloids", which contain nitrogen (but not the nitrogen heterocycle) and also originate from amino acids. Examples include mescaline, adrenaline and ephedrine. Alkaloids are generated by various living organisms, especially by higher plants – about 10 to 25% of those contain alkaloids. Therefore, in the past the term "alkaloid" was associated with plants. ^ Kittakoop P, Mahidol C, Ruchirawat S (2014). "Alkaloids as important scaffolds in therapeutic drugs for the treatments of cancer, tuberculosis, and smoking cessation". Curr Top Med Chem. 14 (2): 239–252. doi:10.2174/1568026613666131216105049. PMID 24359196. ^ Russo P, Frustaci A, Del Bufalo A, Fini M, Cesario A (2013). "Multitarget drugs of plants origin acting on Alzheimer's disease". Curr Med Chem. 20 (13): 1686–93. doi:10.2174/0929867311320130008. PMID 23410167. ^ Cushnie TP, Cushnie B, Lamb AJ (2014). "Alkaloids: An overview of their antibacterial, antibiotic-enhancing and antivirulence activities". Int J Antimicrob Agents. 44 (5): 377–386. doi:10.1016/j.ijantimicag.2014.06.001. PMID 25130096. ^ Qiu S, Sun H, Zhang AH, Xu HY, Yan GL, Han Y, Wang XJ (2014). "Natural alkaloids: basic aspects, biological roles, and future perspectives". Chin J Nat Med. 12 (6): 401–406. doi:10.1016/S1875-5364(14)60063-7. PMID 24969519. ^ Robbers JE, Speedie MK, Tyler VE (1996). "Chapter 9: Alkaloids". Pharmacognosy and Pharmacobiotechnology. Philadelphia: Lippincott, Williams & Wilkins. pp. 143–185. ISBN 978-0683085006. ^ Rhoades, David F (1979). "Evolution of Plant Chemical Defense against Herbivores". In Rosenthal, Gerald A.; Janzen, Daniel H (eds.). Herbivores: Their Interaction with Secondary Plant Metabolites. New York: Academic Press. p. 41. ISBN 978-0-12-597180-5. ^ Oscar Jacobsen, "Alkaloide" in: Ladenburg, Handwörterbuch der Chemie (Breslau, Germany: Eduard Trewendt, 1882), vol. 1, pp. 213–422. ^ a b c van der Heijden, Robert; Jacobs, Denise I.; Snoeijer, Wim; Hallard, Didier; Verpoorte, Robert (2004). "The Catharanthus alkaloids: Pharmacognosy and biotechnology". Current Medicinal Chemistry. 11 (5): 607–628. doi:10.2174/0929867043455846. PMID 15032608. ^ a b c d e f g h i Dimitris C. Gournelif; Gregory G. Laskarisb; Robert Verpoorte (1997). "Cyclopeptide alkaloids". Nat. Prod. Rep. 14 (1): 75–82. doi:10.1039/NP9971400075. PMID 9121730. ^ Blankenship JD, Houseknecht JB, Pal S, Bush LP, Grossman RB, Schardl CL (2005). "Biosynthetic precursors of fungal pyrrolizidines, the loline alkaloids". ChemBioChem. 6 (6): 1016–1022. doi:10.1002/cbic.200400327. PMID 15861432. ^ Faulkner JR, Hussaini SR, Blankenship JD, Pal S, Branan BM, Grossman RB, Schardl CL (2006). "On the sequence of bond formation in loline alkaloid biosynthesis". ChemBioChem. 7 (7): 1078–1088. doi:10.1002/cbic.200600066. PMID 16755627. ^ Schardl CL, Grossman RB, Nagabhyru P, Faulkner JR, Mallik UP (2007). "Loline alkaloids: currencies of mutualism". Phytochemistry. 68 (7): 980–996. doi:10.1016/j.phytochem.2007.01.010. 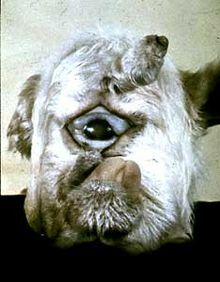 PMID 17346759. ^ Joseph P. Michael (2002). "Indolizidine and quinolizidine alkaloids". Nat. Prod. Rep. 19 (5): 458–475. doi:10.1039/b208137g. ^ a b c Kenneth W. Bentley (1997). "β-Phenylethylamines and the isoquinoline alkaloids" (PDF). Nat. Prod. Rep. 14 (4): 387–411. doi:10.1039/NP9971400387. PMID 9281839. ^ John R. Lewis (2000). "Amaryllidaceae, muscarine, imidazole, oxazole, thiazole and peptide alkaloids, and other miscellaneous alkaloids". Nat. Prod. Rep. 17 (1): 57–84. doi:10.1039/a809403i. PMID 10714899. ^ Richard B. Herbert; Herbert, Richard B.; Herbert, Richard B. (1999). "The biosynthesis of plant alkaloids and nitrogenous microbial metabolites". Nat. Prod. Rep. 16 (2): 199–208. doi:10.1039/a705734b. ^ a b c d Keglevich, Péter; Hazai, Laszlo; Kalaus, György; Szántay, Csaba (2012). "Modifications on the basic skeletons of vinblastine and vincristine". Molecules. 17 (5): 5893–5914. doi:10.3390/molecules17055893. PMC 6268133. PMID 22609781. ^ Atta-ur-Rahman and M. Iqbal Choudhary (1997). "Diterpenoid and steroidal alkaloids". Nat. Prod. Rep. 14 (2): 191–203. doi:10.1039/np9971400191. PMID 9149410. ^ "Caffeine". DrugBank. Retrieved 12 February 2013. ^ "Cocaine". DrugBank. Retrieved 12 February 2013. ^ "Codeine". DrugBank. Retrieved 12 February 2013. ^ "Nicotine". DrugBank. Retrieved 12 February 2013. ^ "Morphine". DrugBank. Retrieved 12 February 2013. ^ "Yohimbine". DrugBank. Archived from the original on 30 January 2013. Retrieved 12 February 2013. ^ Hirata, K.; Miyamoto, K.; Miura, Y. (1994). "Catharanthus roseus L. (Periwinkle): Production of Vindoline and Catharanthine in Multiple Shoot Cultures". In Bajaj, Y. P. S. (ed.). Biotechnology in Agriculture and Forestry 26. Medicinal and Aromatic Plants. VI. Springer-Verlag. pp. 46–55. ISBN 9783540563914. ^ a b Gansäuer, Andreas; Justicia, José; Fan, Chun-An; Worgull, Dennis; Piestert, Frederik (2007). "Reductive C—C bond formation after epoxide opening via electron transfer". In Krische, Michael J. (ed.). Metal Catalyzed Reductive C—C Bond Formation: A Departure from Preformed Organometallic Reagents. Topics in Current Chemistry. 279. Springer Science & Business Media. pp. 25–52. doi:10.1007/128_2007_130. ISBN 9783540728795. ^ Hardouin, Christophe; Doris, Eric; Rousseau, Bernard; Mioskowski, Charles (2002). "Concise synthesis of anhydrovinblastine from leurosine". Organic Letters. 4 (7): 1151–1153. doi:10.1021/ol025560c. ^ Morcillo, Sara P.; Miguel, Delia; Campaña, Araceli G.; Cienfuegos, Luis Álvarez de; Justicia, José; Cuerva, Juan M. (2014). "Recent applications of Cp2TiCl in natural product synthesis". Organic Chemistry Frontiers. 1 (1): 15–33. doi:10.1039/c3qo00024a. ^ Castells, Eva; Berenbaum, May R. (June 2006). "Laboratory Rearing of Agonopterix alstroemeriana, the Defoliating Poison Hemlock (Conium maculatum L.) Moth, and Effects of Piperidine Alkaloids on Preference and Performance". Environmental Entomology. 35 (3): 607–615. doi:10.1603/0046-225x-35.3.607 – via ResearchGate. Wikimedia Commons has media related to Alkaloid. Wink, M (2009). "Mode of action and toxicology of plant toxins and poisonous plants". Mitt. Julius Kühn-Inst. 421: 93–112. Retrieved 18 March 2014.